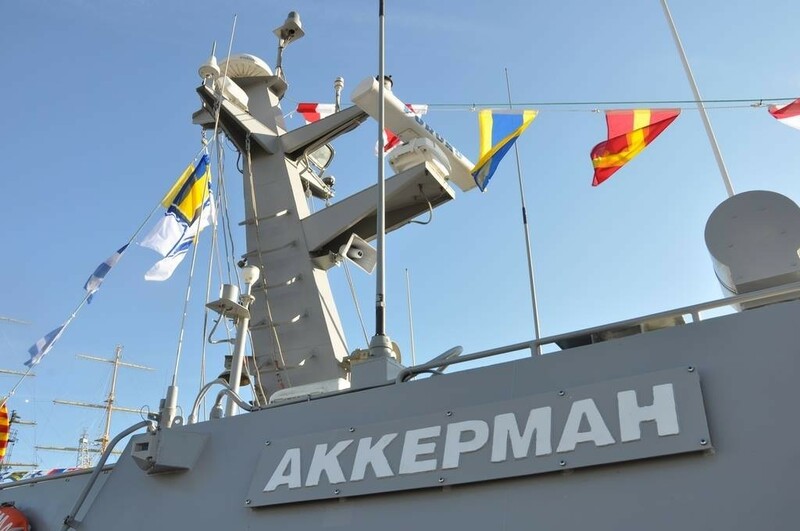 Akkerman (U174) and Berdiansk (U175) first two boats in the class. The first two keels were laid in October 2012 but the whole project was frozen for two years. 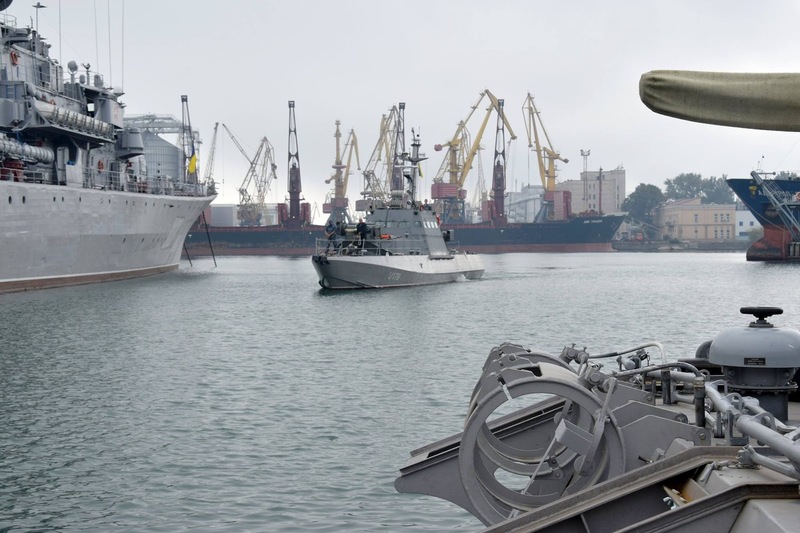 Then the PJSC Leninska Kuznya Plant resumed the construction of the two boats in October 2014 and they were officially launched in November of 2015. Four (4) more boats were were laid in April 2016 and launched in June of 2017. 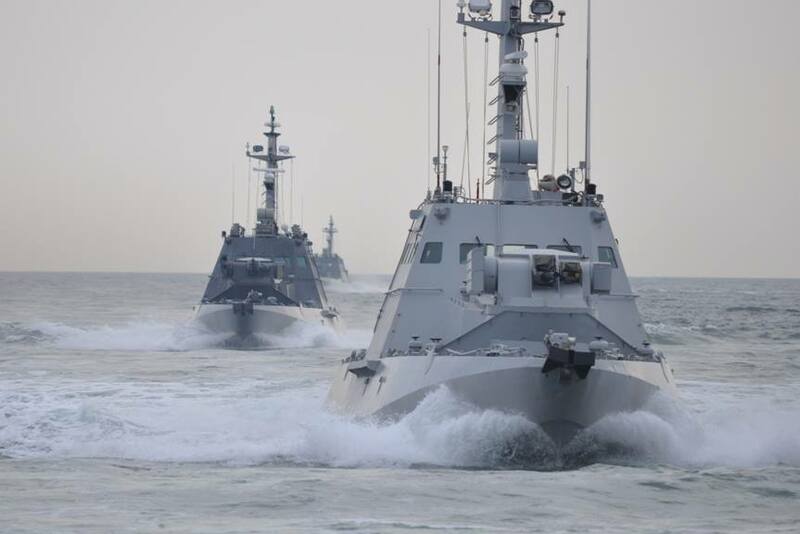 All of them are currently under sea trials. 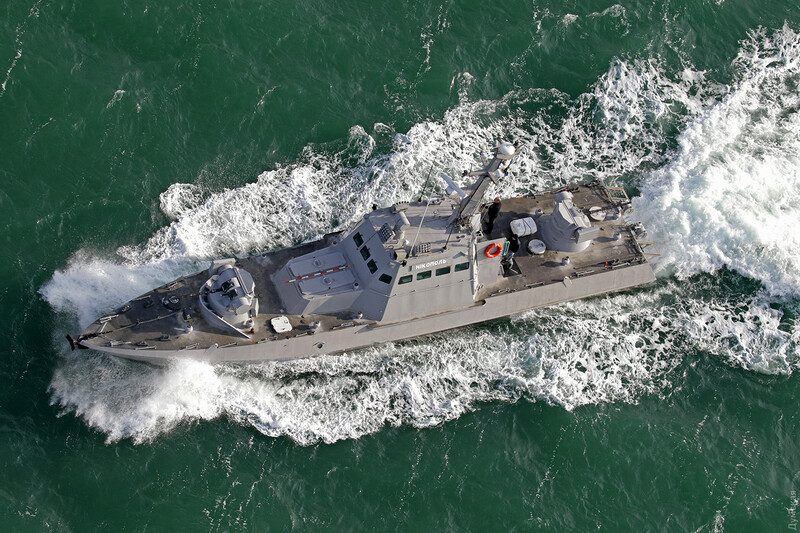 The lead boat in the class. 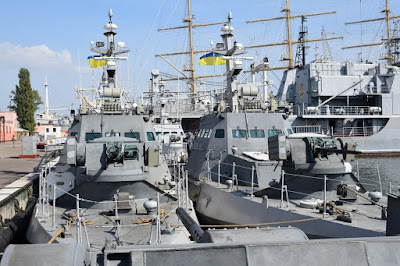 Stern view of two Gurza-M class boats. 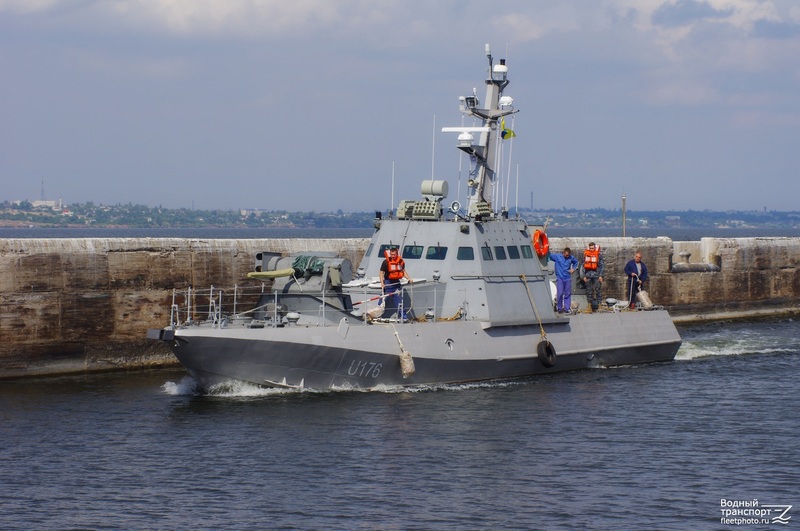 The general characteristics of the Gurza-M class are 23m length, about 54 tons displacement at full load, a maximum speed of 28 knots and a range of 900n.m. 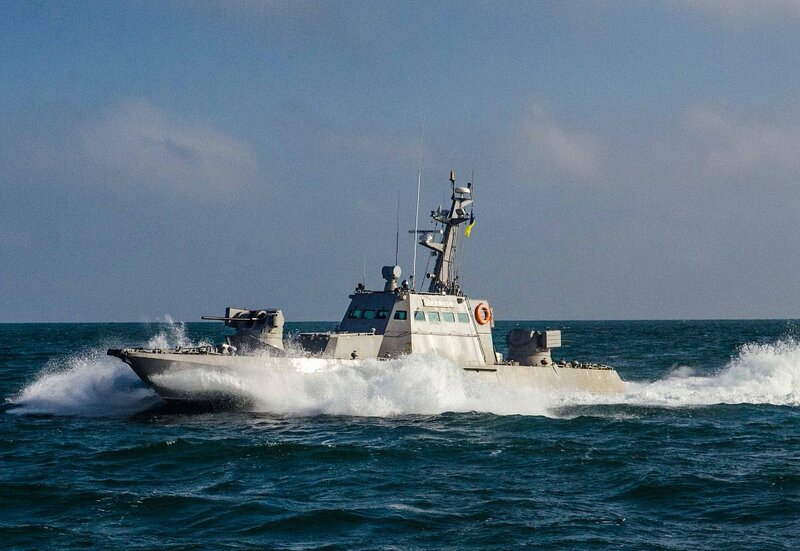 with the speed of 12 knots. Its crew is 5 men of which one of them is officer. The draught is only 1 meter thus the boat can easily go anywhere close to shore and of course to shallower depths of river sailing. Their small size makes them also harder to detect via radar. These boats are capable of policing rivers, harbors, lakes and in general littoral areas up to 20 nautical miles off shore as well as the protection against smuggling, engagement of point coastal targets (tanks, bunkers, infantry etc.) 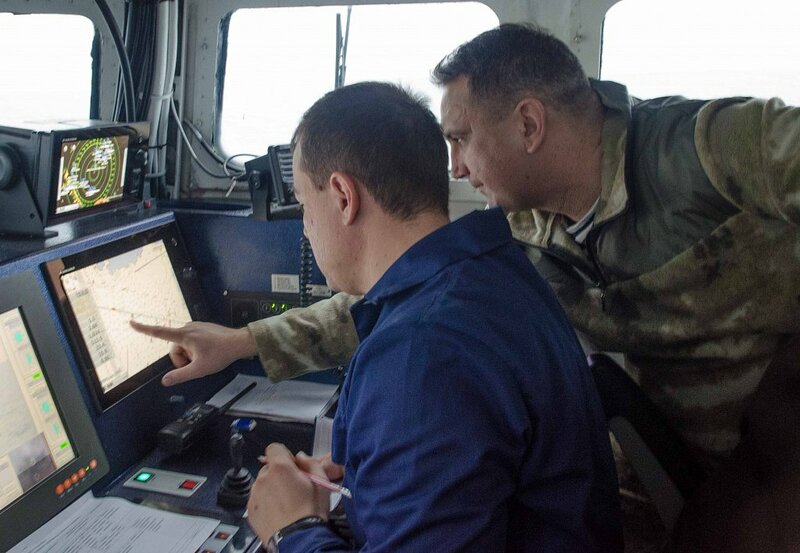 and the provision of reconnaissance and tactical raiding support. 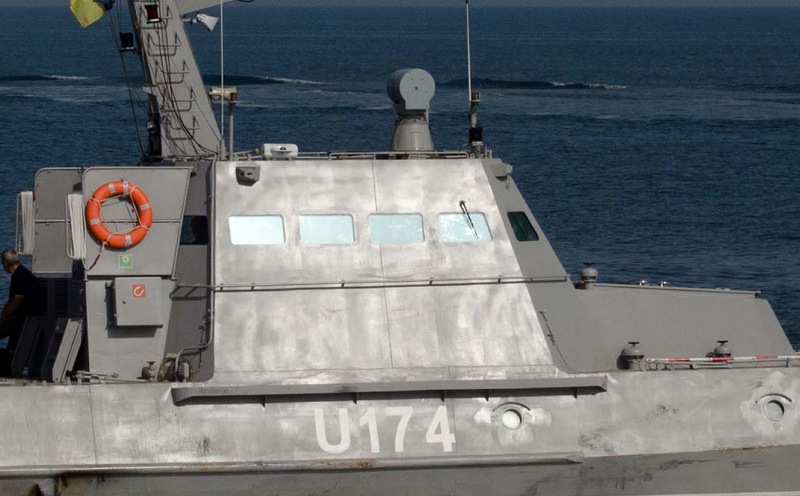 The boats are built with the use of bullet-resistant steel materials (8mm thick armor). 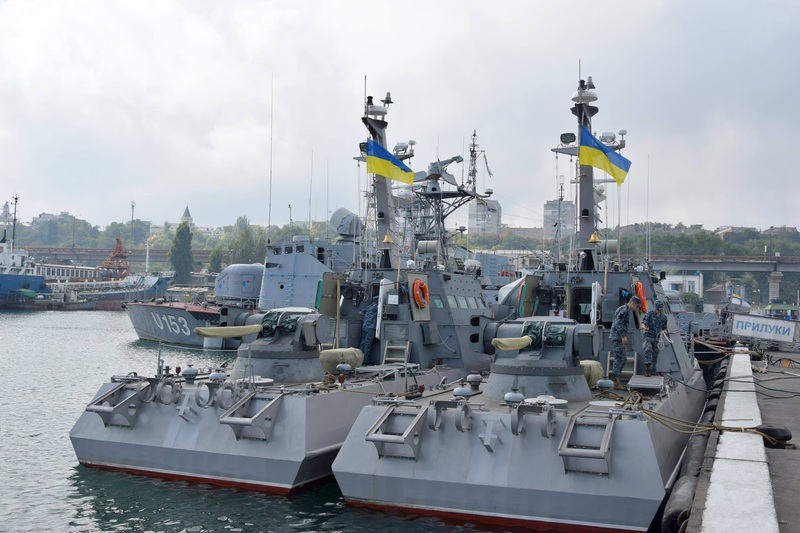 Till the end of 2017, Ukraine will have in active service six (6) of those artillery boats while about 12-14 are under construction. 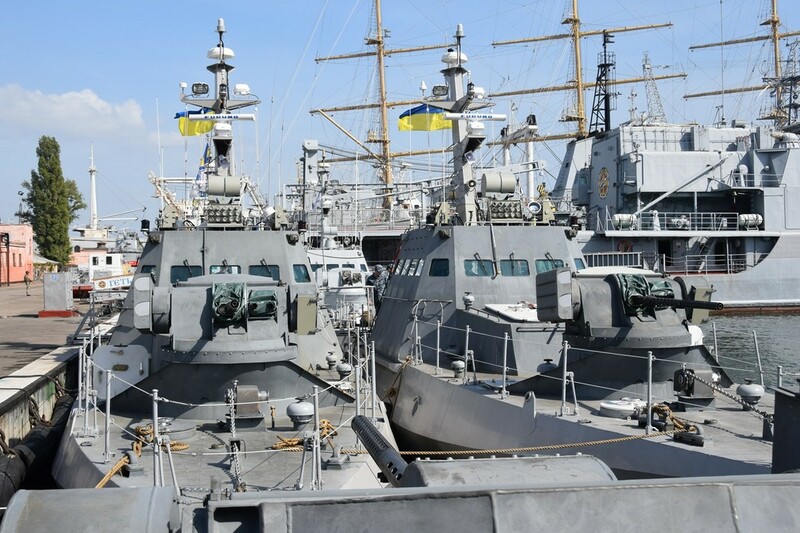 The Ukrainian Navy is set to take delivery of about 20 boats by 2020 which will form the backbone of the Ukrainian Navy. 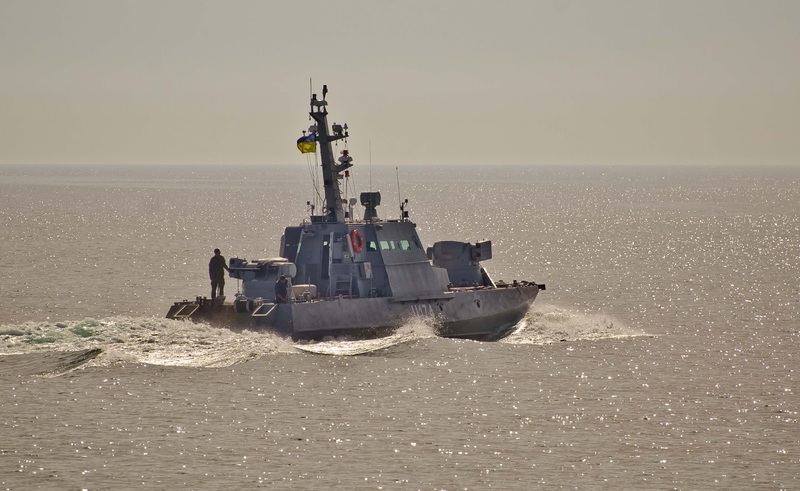 The modernized Desert Vipers of the Ukrainian Naval Forces! 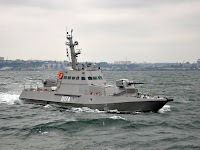 The main armament of the boat is two remotely operated BM-5M.01 Katran-M turrets, located forward and aft the bridge, that are equipped with an impressive variety of weapons including a gun, a heavy machine gun, a grenade launcher and two launchers for anti-tank guided missile (ATGM)! Modified photo of a Gurza-M class armored artillery boat. For a high resolution image click here. 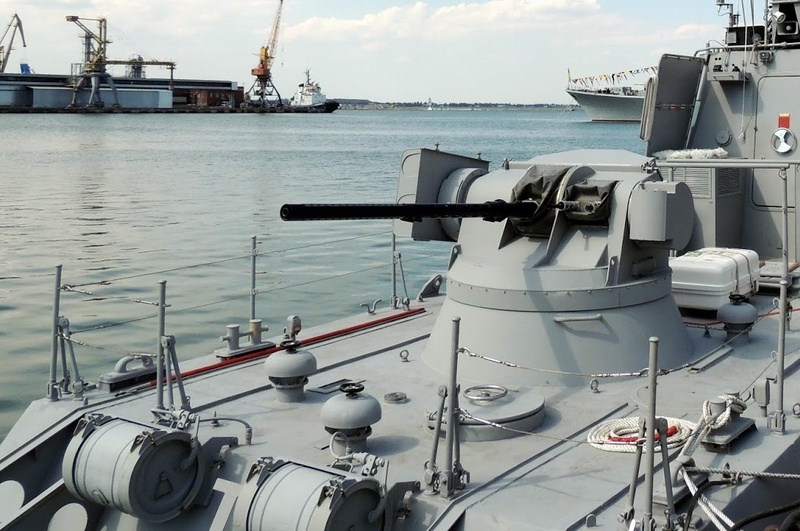 This turret is built by Mykolayiv Mechanical Repair Plant. 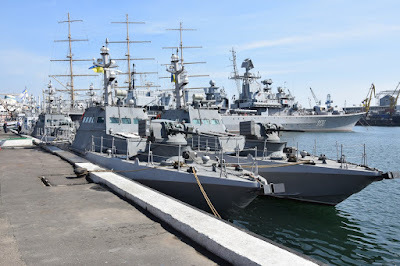 It is the naval counterpart of the fighting module BM-3 Shturm weapons stations developed for infantry fighting armored vehicles. Each Katran-M module is fitted with a ZTM1 30-mm automatic cannon, a coaxial KBA-117 30-mm automatic grenade launcher, a coaxial KT 7.62mm light machine gun and the most important with two Barrier anti-tank guided missiles (ATGM) with a laser guidance system. The KAU-30M combat module is intended for the destruction of ships (boats), as well as mobile and fixed armored targets, light armored objects, live power, coastal fire fortified points and helicopters located on the shore. 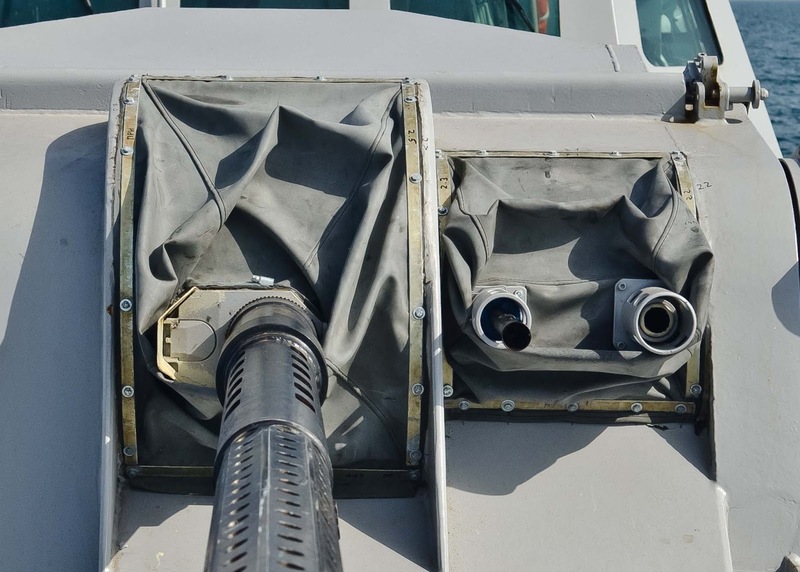 The ZTM-series automatic cannons are designed to engage light armored infantry fighting vehicles, dismounted infantry and low-flying aircraft. 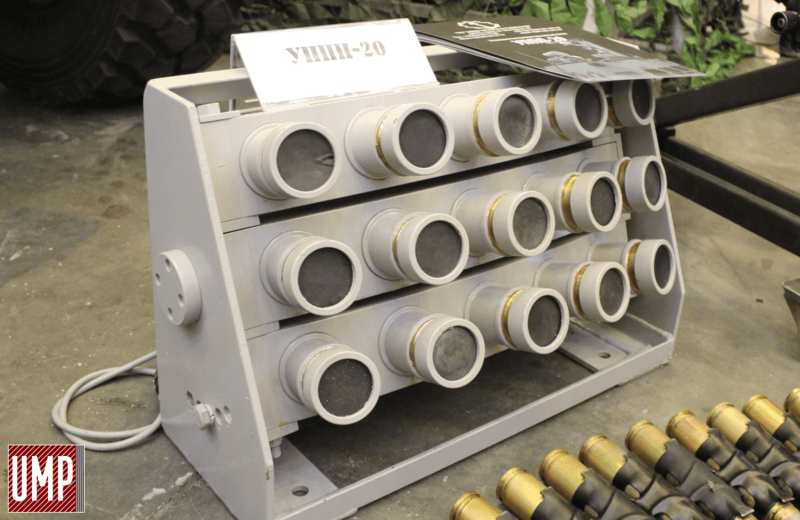 The cannons deliver high-explosive or armor piercing rounds loaded from belt magazines stored in two ammunition boxes. 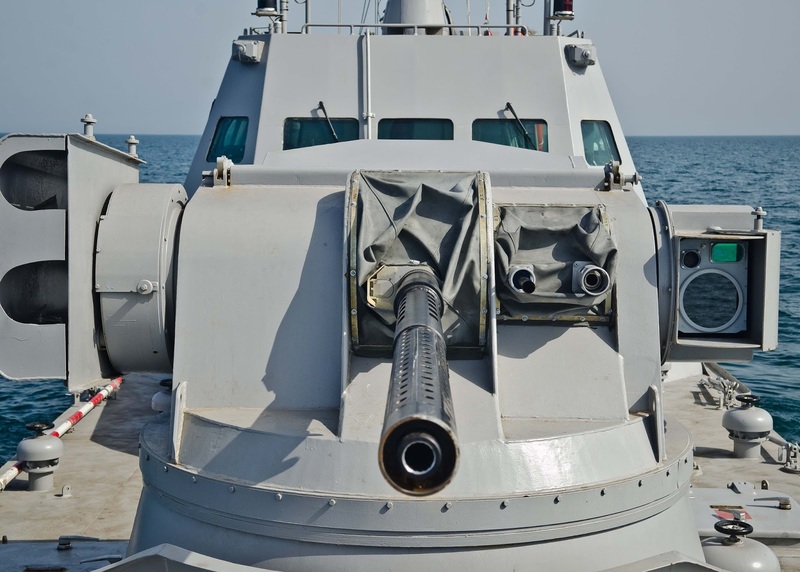 Each of the automatic cannons is provided with up to 2x400 rounds of ready use ammunition of various types. According to the manufacturer, effective range of the ZTM1 30-mm automatic cannon when engaging ground targets such as light armoured vehicles is 1,500m with Armor Piercing (AP) shells while soft-skinned targets can be engaged out to 4,000 meters with High Explosive Tracer (HET) and High Explosive Incendiary (HEI) shells. 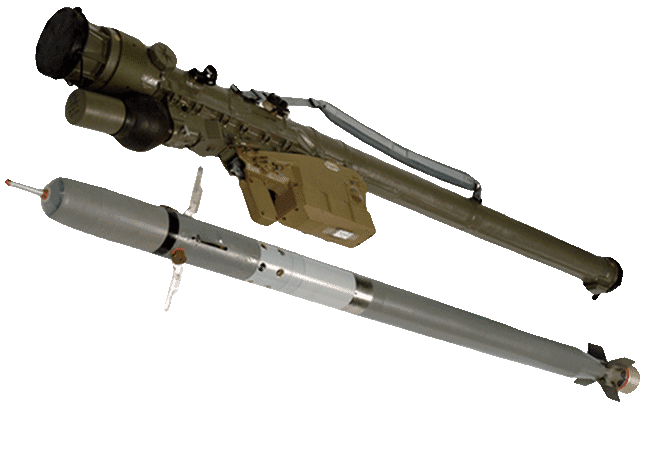 Air targets can be engaged flying at low altitudes of up to 2,000 m at subsonic speeds and up to a slant range of 2,500 m. The rate of fire is 330 rounds per minute. 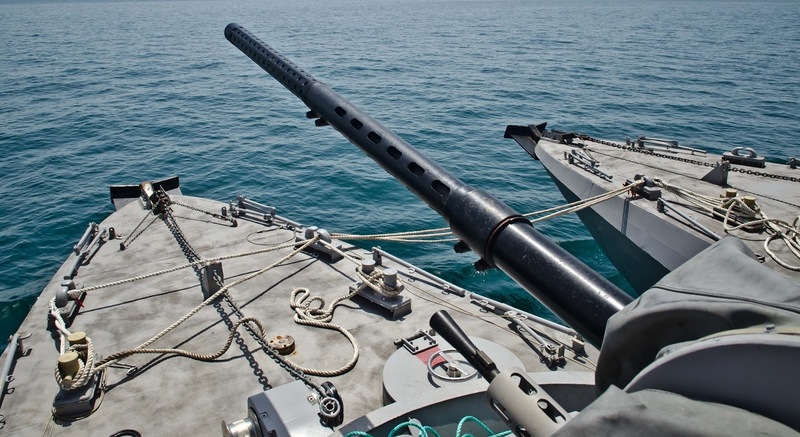 The KBA-117 30-mm automatic grenade launcher is set to provide medium range fire support against enemy personnel and unarmored targets and is fed by a 29-round metal belt (three are carried on board). The rate of fire is up to 420rds/min and the maximum effective range is 1,700m. The KT-7,62 (PKT) 7.62mm machine gun has a maximum rate of fire 700-800 rpm, an effective range of about 2km. 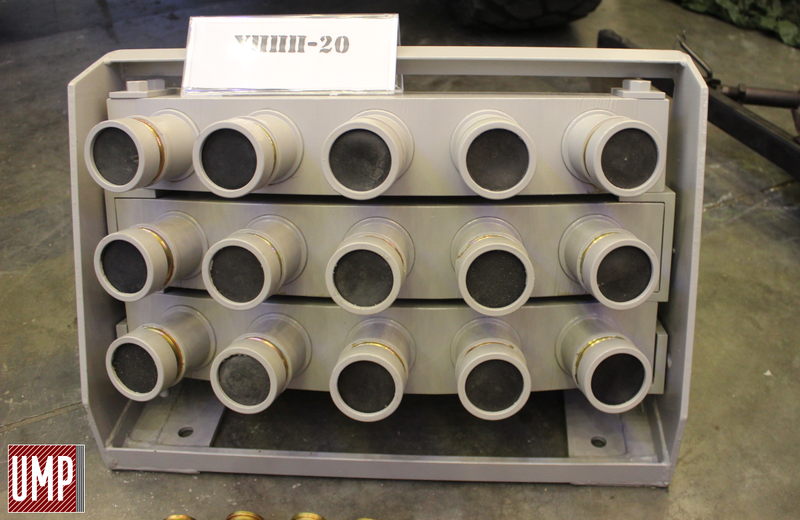 The ready use ammunition is 2,000 rounds. 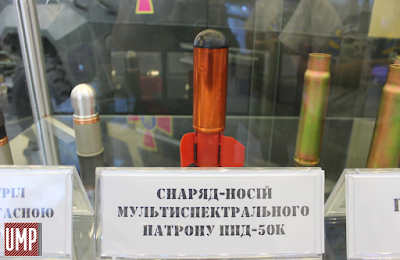 The Katran-M's laser guidance system. 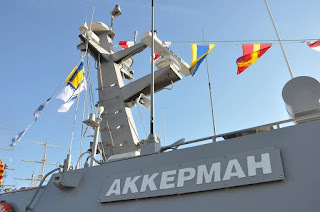 The most important weapon aboard the vessels is the Barrier anti-tank guided missile (ATGM) of which two are ready to fire on each of the Katran turrets. 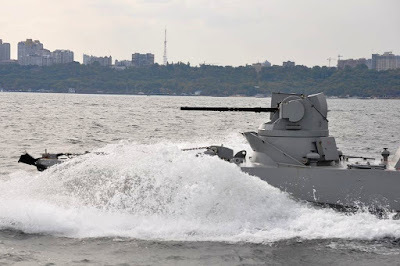 With this weapon the boat can fight against stationary and moving armoured objects (vehicles, craft, small fortifications, etc. ), helicopters and modern armoured combat vehicles, fitted with explosive reactive armour (ERA). 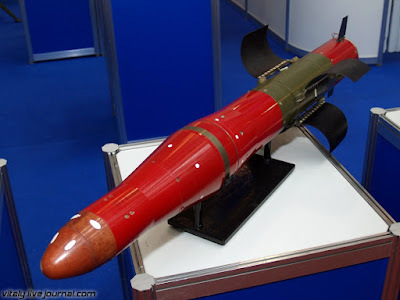 Equipped with a tandem hollow-charge warhead, the ATGM can engage targets at a distance between 100m to 5,000m via Semi-Automatic Laser (SAL) guidance by the PN-VK (or else Triad?) 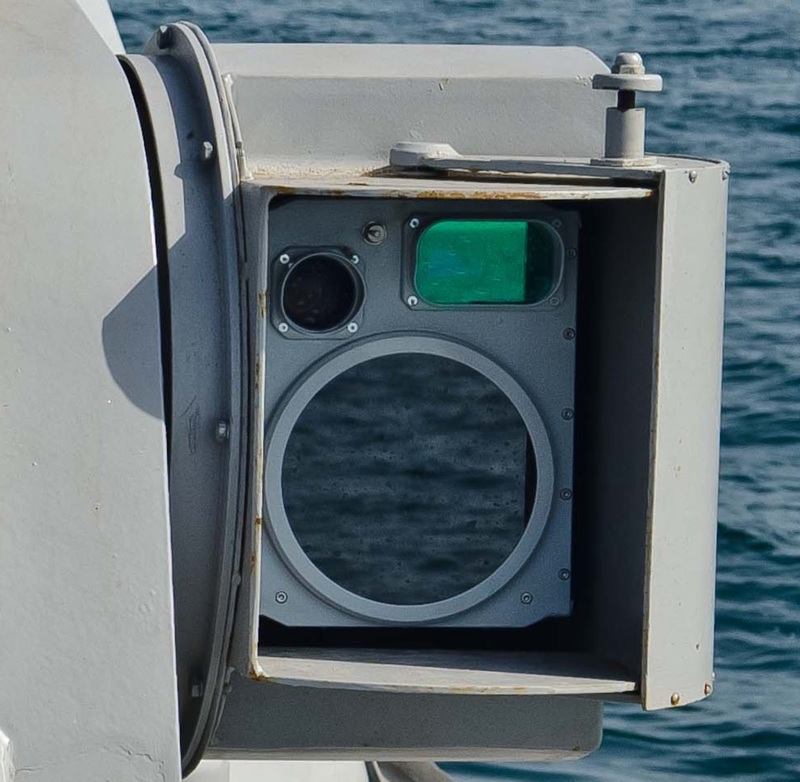 missile guidance system that equips each Katran turret, after being designated and lock-on, to be tracked automatically (all-weather capability) without further operator’s intervention.The system includes two TV cameras, a thermal imaging camera and a laser-ranger finder. The detection range of the missile guidance system is 10km for a vehicle while the effective range is 4 km or more with the use of fragmentation shells, 2km when using armor-piercing shells and 2.5km for air targets. The interior of the bridge and CMS of the boats. 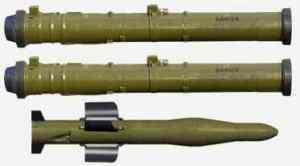 The missile's caliber is 130 mm and the wight of projectile is 16kg. 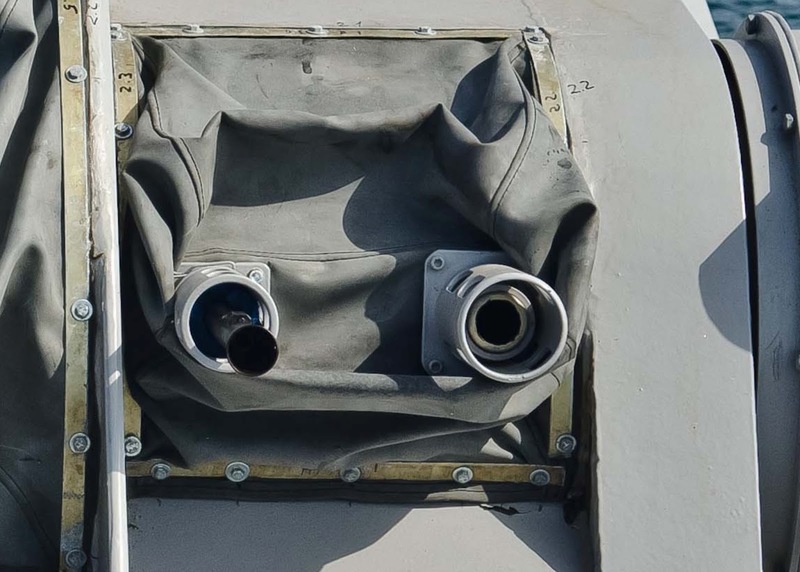 The missile defeats armored infantry fighting vehicle (AIFV) protection systems of all kinds – be it a composite armor, active protection system, spaced armor or explosive reactive armor (ERA), and is capable of penetrating 800mm of Rolled Homogenous Armor (RHA) behind ERA. 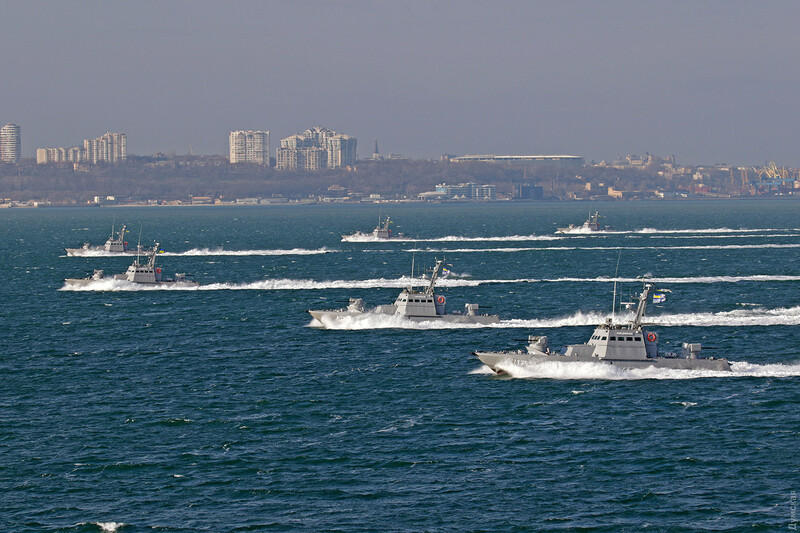 The boats are equipped with the UPPP-20 protection system that consists of four laser warning receivers and three decoy launching systems. 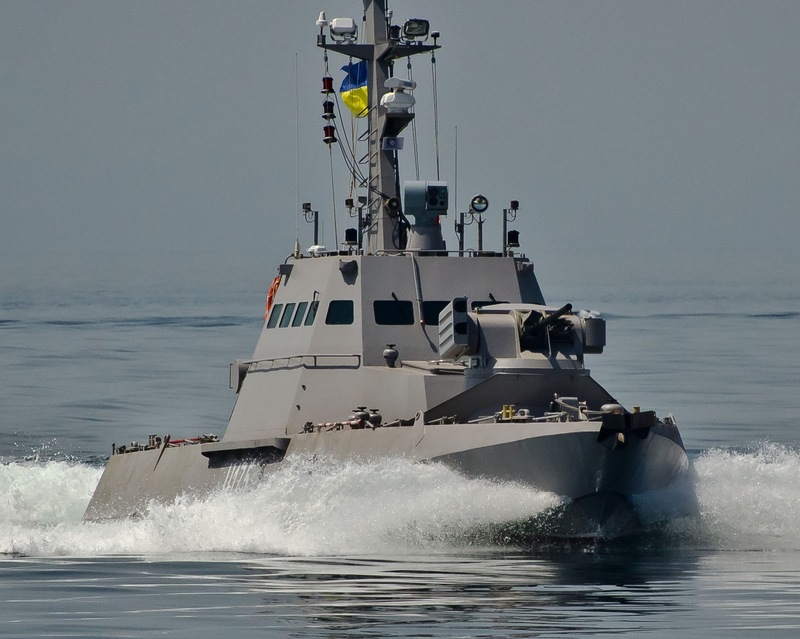 Each automatic decoy system consists of a 15 50 mm decoy launchers designed to protect the vessel from unexpected attacks. 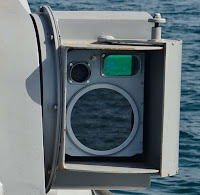 The system works after the signal is received from the laser warning receivers, while the system recognizes the threat and launches the decoys with multispectral smoke projectiles in the direction of the threat movement. The rack for laying mines. 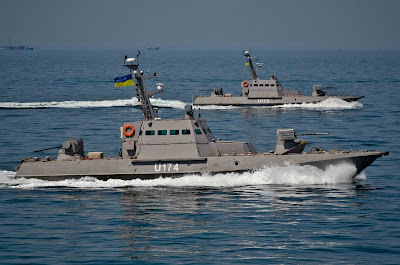 Except the two weapons turrets, the boats in the class carry a number of 9K38 Igla-variant (probably SA-18) Man-Portable Air-Defense Systems (MANPADS), in order to protect themselves from low flying aircraft. The warhead weights 1.17 kg with 390 g (14 oz) explosive and the operational range is up to 5km. The boats also have rails at the stern for minelaying and thus they have the capability to deploy a small number of explosive mines at certain areas in order to hamper enemy shipping movements, lock vessels into a harbor or to protect friendly vessels and create "safe" zones. 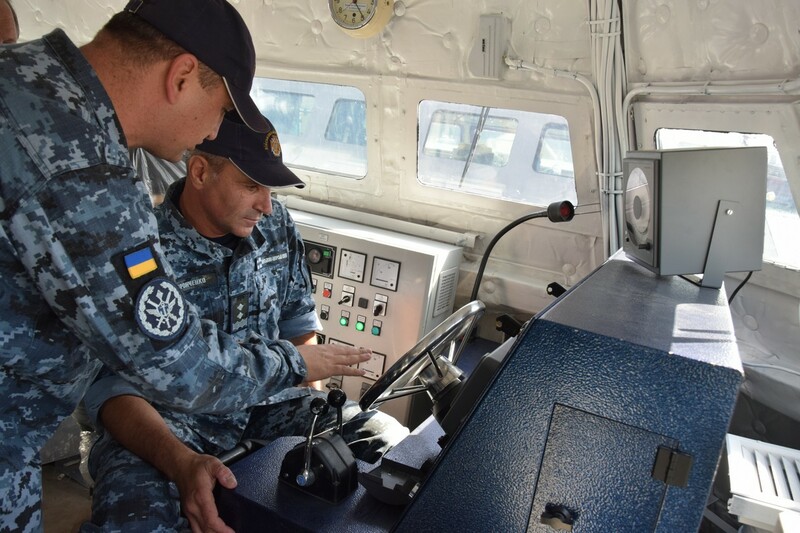 Each boat is equipped with a KVANT RI Sarmat electro-optical fire control sensor installed on the bridge's roof. 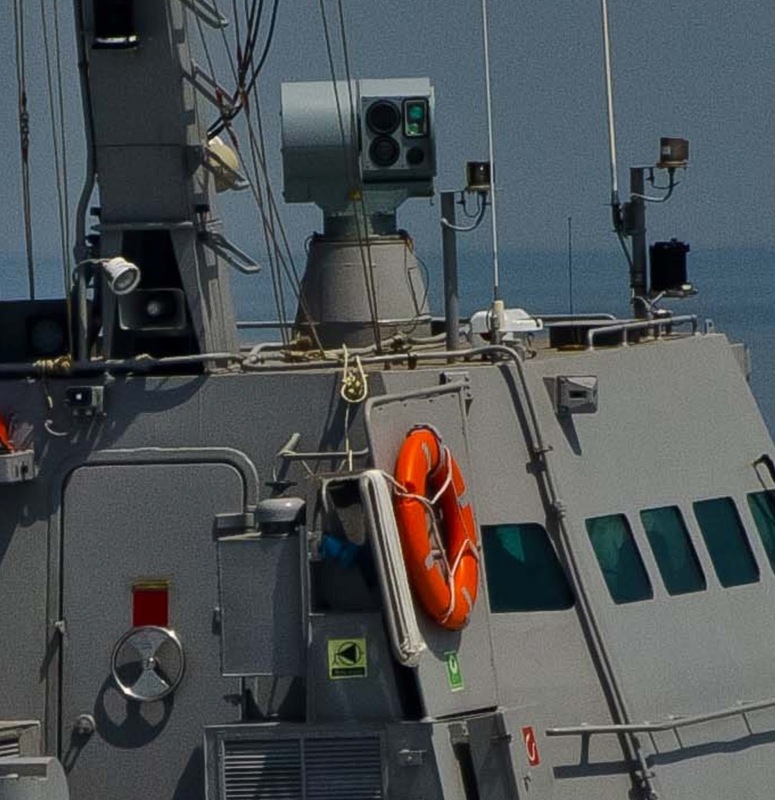 In addition to fire control system, each turret is equipped with its own laser guidance system / optronic director. 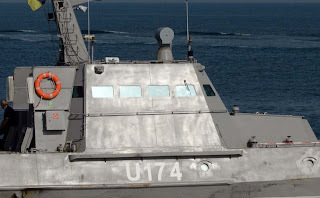 The equipment completes one Furuno X-band navigation radar, one unspecified radome radar system atop of the mast as well as communication antennas and one omni directional receiving unit part of electronic support measures system (ESM) of the boat. 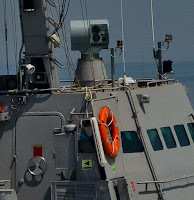 The main mast of Gurza-M class boat. 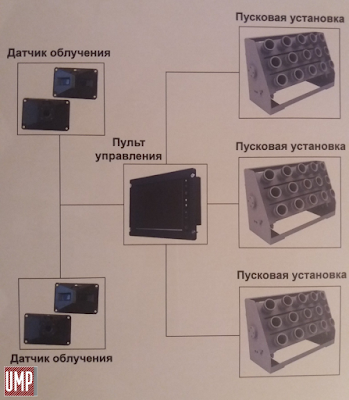 SARMAT EO sensor and warning receivers. 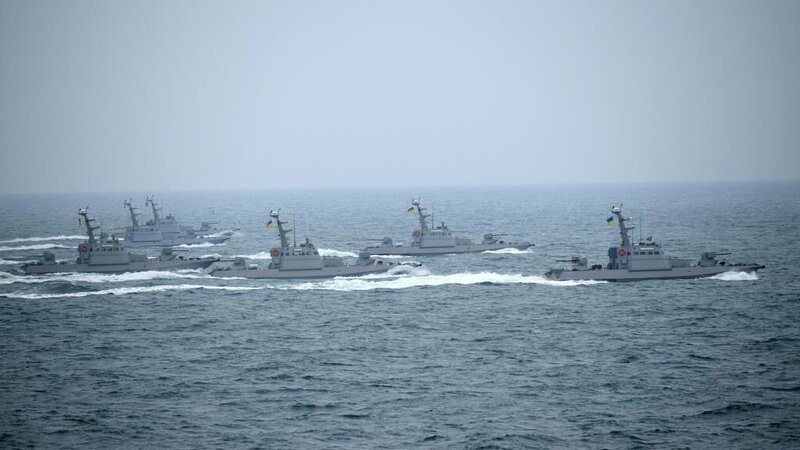 Gurza-M boats in formation. Source. A Desert Viper-M in high speed. 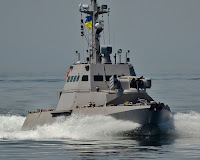 Insufficient seaworthiness - due to the small displacement Gyurza-M is able to go into the sea at waves only up to 4 points . Limited weapons capabilities - Gyurza-M can use weapons at waves only up to 2 points. 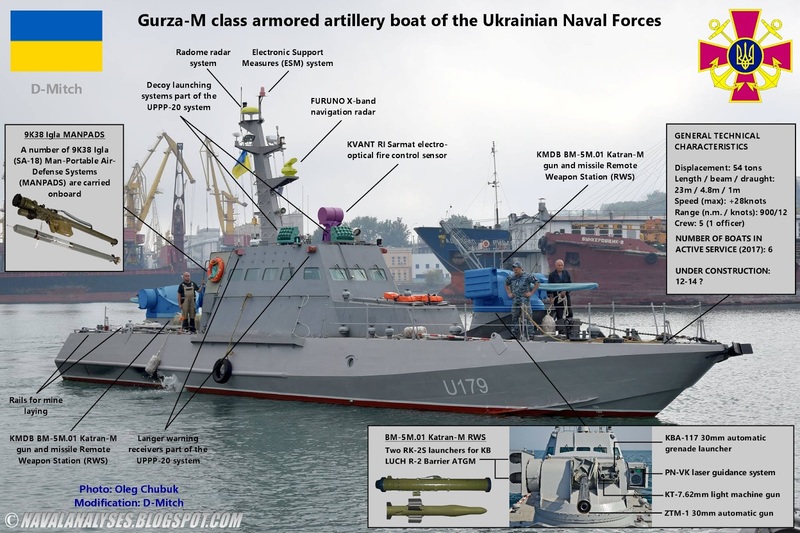 Missing anti-ship weapons - Gyurza-M has a 30-mm cannon and Barrier ATGM, which allows the boat to fight only boats of the same displacement, and at a short range. 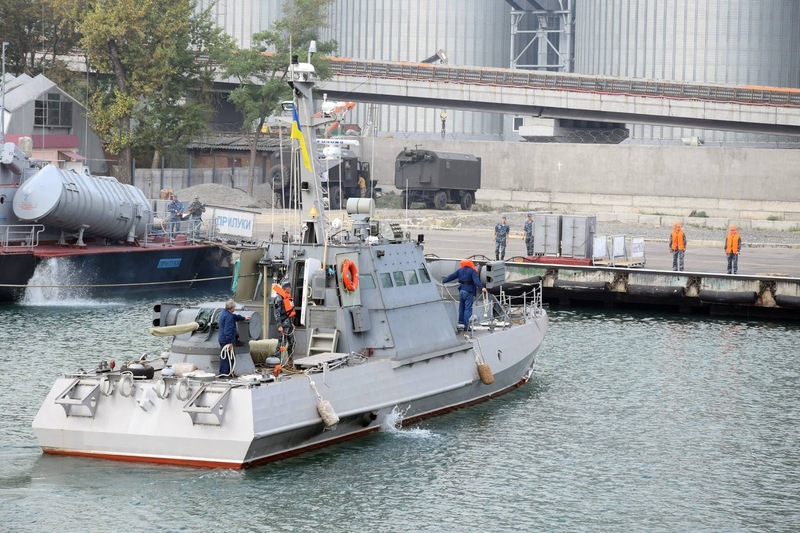 In addition, anti-tank missiles have not been installed on boats, and pilot launches have not been conducted on the water. 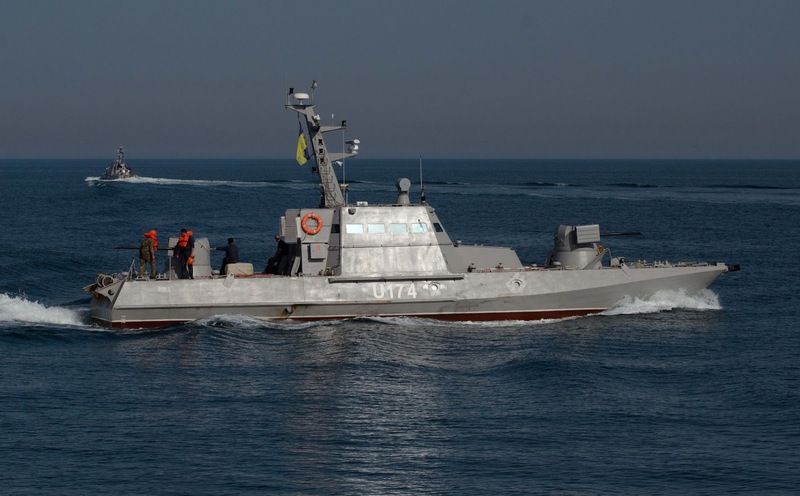 Low patrol range - despite the fact that the boat is sufficient for such a class of autonomy (5 days), and the range (700 miles), the range of patrol is limited to only 12 miles due to the small size of the boat that means less supplies for the crew. 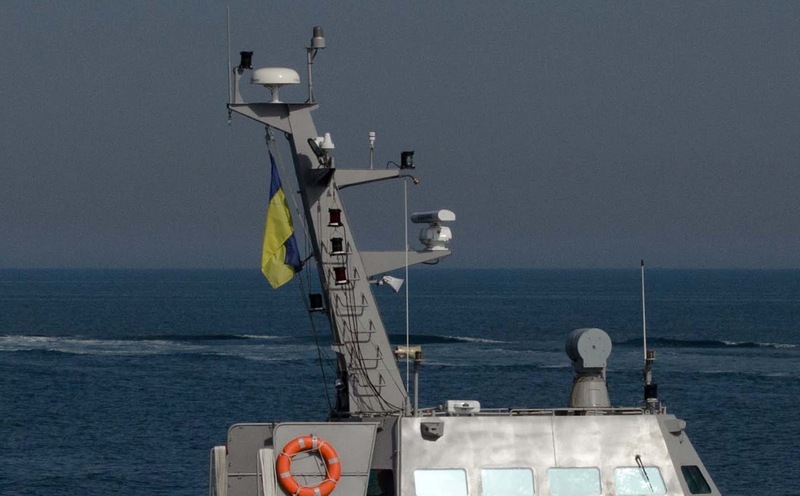 Also the speed is very low for such vessels. All six Gurzas in formation! 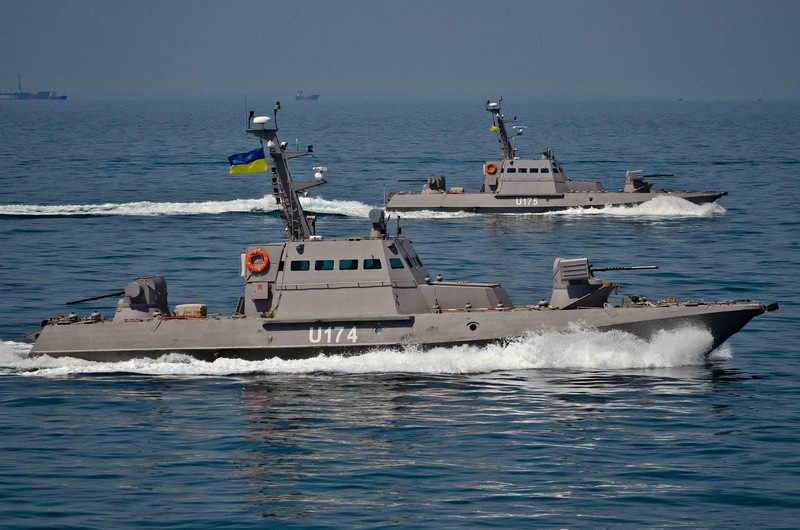 Nevertheless, Ukraine needs urgently a large number of armed boats to protect its borders. 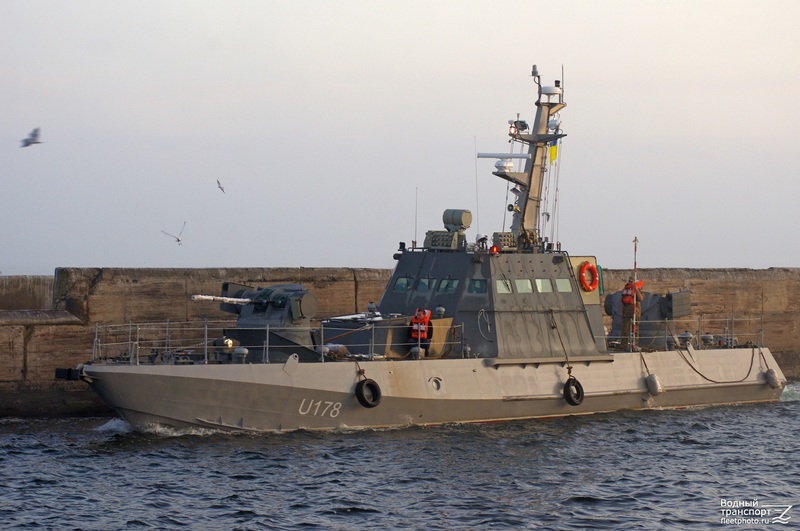 Gurza-M is cheap to build in comparison with other European designs and it looks at least on paper very well equipped for a 50-ton vessel. 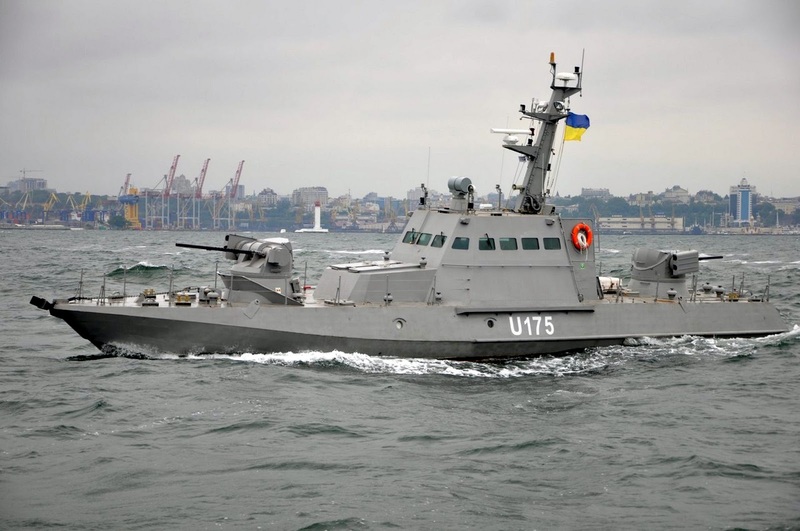 It is noticeable also that the design uses Ukrainian-built equipment in a large extent. 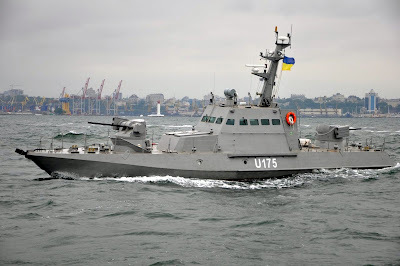 Combat capable or not under all-weather conditions, I cannot say for sure if this is what Ukraine needs now, however the new boat is quite agile, well-protected and carries a very heavy armament for its size. An enlarged Gurza-M variant, with two times the length of project 58155 and at least 8 times its displacement, equipped with a modern medium range anti-ship missile such as MBDA Marte Mk2, and secondary armament Katran-M turrets except a 76mm main gun, could be the ideal solution for the Ukrainian Navy and a vessel that Ukraine could afford to build in numbers (6-8 vessels). 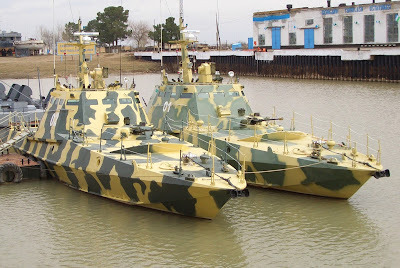 Then the Gurza-M class production could stop at the 8-10 units dedicated to patrol only rivers and lakes. 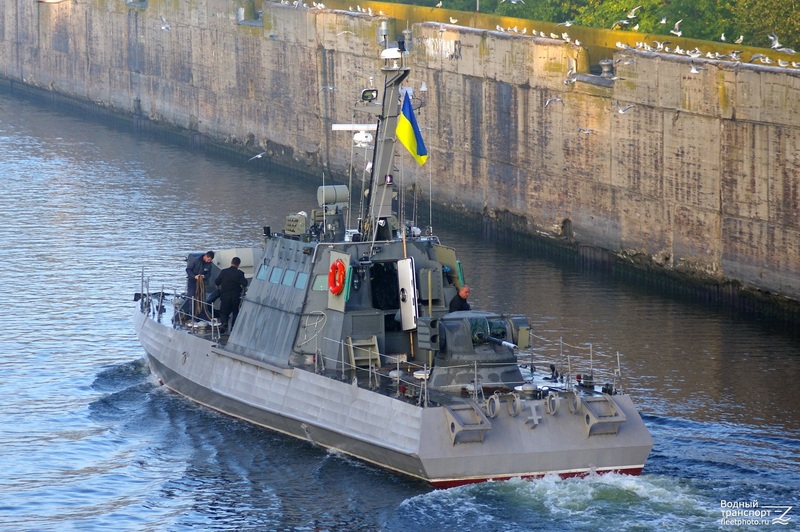 The decision though has been taken and the Desert Vipers-M will form the basis of the new Ukrainian naval fleet. You can watch a recent video of the class here. 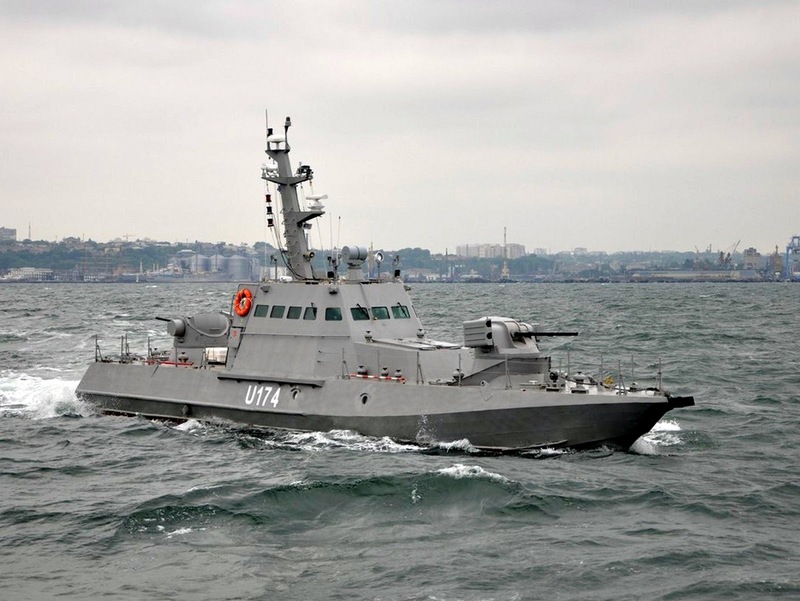 the project Gyurza-M is intended for actions on the sea and rivers. Hence the relevant seaworthiness.